Congratulations to the UIU Mock Trial team members, who competed in the team’s debut tournament at Macalester College in St. Paul, Minnesota, this past weekend. The Peacock team posted three wins, four losses, and one tie in its inaugural competition. 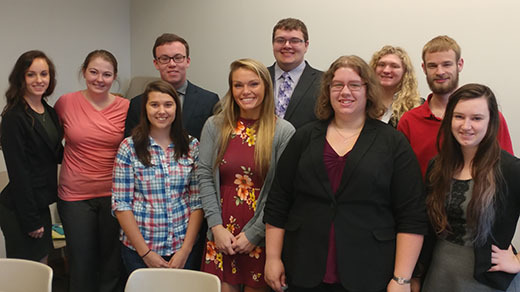 Congratulations to team members (front, l-r) Elizabeth Creveling, Erin Drahozal, Alison Leuchtenmacher, Josie Roulson; (back) Kortney Lightfoot, Ashley Brock, Cory Mullins, Christopher Kragnes, Jr., Breanna Ellis and Josh Norris. The team is coached by professors Chris and Tiffany Kragnes. The team’s next competition is this weekend at Creighton University in Omaha, Nebraska.